One day a few years ago, while working on wasps in a rainforest in Costa Rica, entomologist Kevin J. Loope, a postdoctoral researcher at the University of California, Riverside, began reading about the enigmatic matricidal behavior of some social insects. In most social insects, such as bees, ants and wasps, the workers, which are all female, work their whole lives to help the queen produce new offspring. Yet, in the literature Loope found anecdotal reports of workers killing their queen, presenting a fascinating evolutionary puzzle. "The observations of queen-killing seemed paradoxical to me," Loope said. "Why does it pay to help the queen in some situations but then also pay to kill her in others? What explains why some queens get killed and not others, and why kill her at all? Most people think of social insects as workers toiling mindlessly for the good of the queen or the colony. But it appears that workers are more calculating, and help or harm the queen depending on the circumstances they find themselves in." To explore the puzzle, Loope set up observation colonies of yellow jacket wasps in the lab, filmed them continuously using video cameras and then noted when matricide happened. He also collected wild colonies to increase the sample size, inferring matricide from mature, queenless colonies. The behavioral observations and genetic analyses of wasp colonies he performed showed him that worker wasps kill queens when they are in colonies with lots of full siblings, but not in colonies with a mix of full and half siblings. 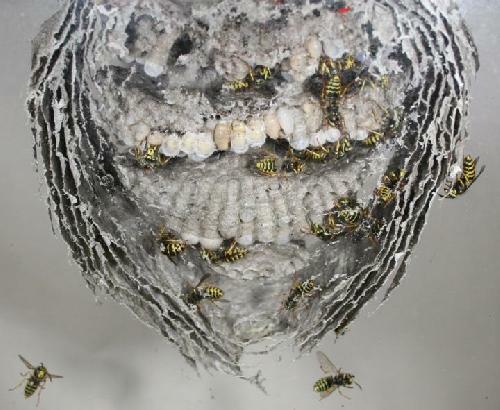 This is an observation nest of yellow jacket wasps that UC Riverside entomologist Kevin Loope used in the study. Credit: Barrett Klein. "Workers are assessing the situation in their colony and deciding to revolt against the queen only when the genetic makeup of the colony makes it favorable to do so," Loope said. "The main advantage is to allow your sister workers to lay male eggs, rather than the queen, who typically stops worker reproduction by egg eating, attacking reproducing workers, and by laying many of her own eggs. By eliminating the queen, a matricidal worker allows other workers and herself to lay male eggs." Workers do all the tasks of raising the brood. They forage for food, feed the offspring and the queen, build the nest and defend it. Only occasionally do they attempt to reproduce. Males are produced at the end of the year and mate with the new queens. Then the males die. due to a quirk in their genetic system. This allows them to compete with the queen for the production of males. "Hence the matricide," Loope said. "Workers are not mindless automatons working for the queen no matter what. They only altruistically give up reproduction when the context is right, but revolt when it benefits them to do so." The study is one of a few that suggest that workers can assess the relative proportions of full and half-siblings of their colony and respond adaptively when conflicts of interest arise over what the colony should do, for example, rear the sons of workers or the sons of the queen. "In highly eusocial species altruism toward the queen is typically unconditional," Loope said. "This study, however, provides the first thorough investigation of queen-killing behavior, a common but difficult-to-observe event in the life of many bee and wasp colonies. I figured out a way to observe colonies continuously using video, which allowed for the first video observations of this behavior." Study results appear online today in Current Biology. Loope explained that the genetic makeup of a colony is determined by how many times a queen mates (usually once or twice), and by how evenly she uses the sperm of two males if she has mated twice. He found that colonies that experienced matricide had a greater proportion of full siblings (measured by the average relatedness between colony members) than those that did not experience matricide. "This pattern is driven by the number of times the queen mates, as well as the evenness of sperm use for queens that have mated twice, suggesting workers can distinguish among these different kinds of queens," Loope said. "A queen-killing worker benefits from matricide in single-father colonies because she causes the colony to rear the sons of other workers, rather than the sons of the queen. In such colonies, workers are more related to workers' sons than queens' sons. "Kin selection theory, an extension of evolutionary theory, predicts behavior to evolve that favors close over more distant relatives; half-siblings are more distant than full siblings, so matricide is less beneficial in colonies with many half-siblings," Loope added. "Thus, this study provides rare support of kin selection theory with variation in behavior among colonies. Workers are responding to their colony makeup as predicted by kin selection theory." Loope is now working to understand how yellow jacket wasps' interaction with other species may shape transitions in social organization.